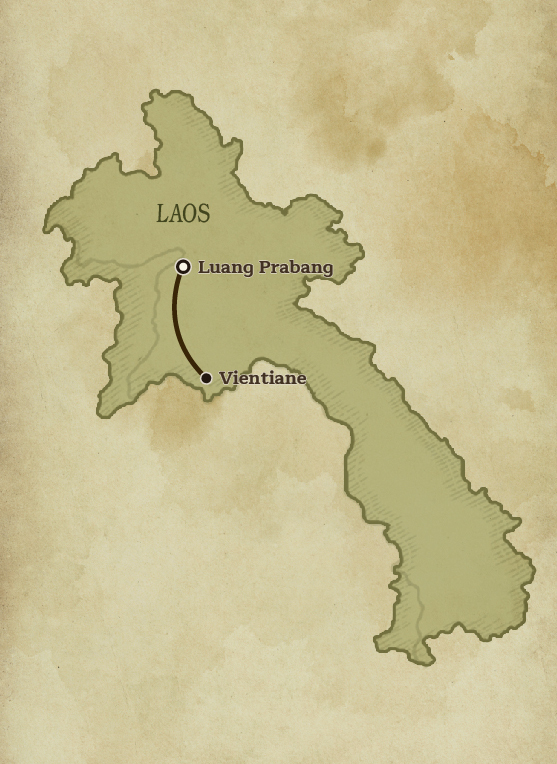 Nestled at the confluence of the Mekong and Nam Khan rivers in northern Laos, the small town of Luang Prabang is considered the heart of Laotian culture. This UNESCO-World Heritage Site and ancient royal capital is also considered one of Southeast Asia’s most beautiful destinations and retains a unique ambiance. Luang Prabang charms with a bewitching blend of ancient gilded temples (wats), saffron-clad monks and faded Indochina colonial-era architecture, encircled by mountains and natural beauty. After sightseeing, don’t miss the town’s night markets, set-up on streets closed-off to vehicles. Various hilltribe traders ply a vast array of colourful ethnic goods, especially hand-woven textiles and handicrafts. 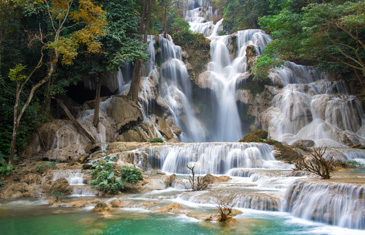 We spend the day exploring one of Luang Prabang’s most picturesque sights, Kuang Si Waterfall. The largest waterfalls in the area, Kuang Si comprises of three cascading tiers leading to a 50m (164ft) drop into spectacular azure pools, surrounded by lush jungle. Take a guided trek along trails to the top of the waterfall, enroute picking herbs, mushrooms, bamboo shoots and other wild plants growing in abundance. We try a hand at fishing local style and help prepare a ‘jungle-style’ picnic lunch with our fresh ingredients. There’s time for a swim in the refreshing pools. Later, we visit the Asian Bear Rescue Centre, located near the waterfall. 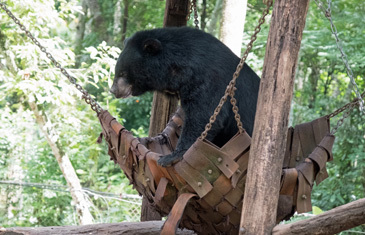 Many bears, including Sun Bears and Malayan Black Bears, have been rescued from the clutches of bile farms or wildlife traffickers. A wooden path allows up-close access to these adorable animals in a natural habitat. At a community-based rice farm, situated in idyllic countryside outside Luang Prabang, we get a rare opportunity to experience the life of a Lao farmer. Try your hand at some farm activities and learn from villagers about local bamboo weaving, blacksmith work and sugar cane processing. Late afternoon, head to Suan Phao Petanque playground, to play a few rounds of Petanque. Introduced to Laos under French colonial rule, Petanque is a game whereby players toss or roll heavy steel balls as close as possible to a small wooden ball, a cochonnet (literally “piglet”). Players must also stand inside a circle with both feet on the ground. Watching the locals play Petanque, our guide explains the game strategy, sharing some welcome tips before commencing play. 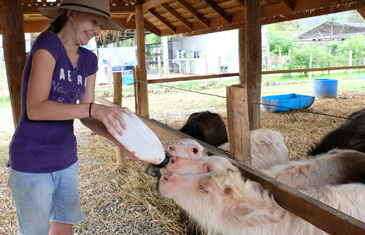 Our day is spent at the first-ever Buffalo Dairy Farm in Laos. This socially-responsible enterprise, consisting of a commercial dairy and production facility, produces dairy products made from Buffalo milk for local and international consumers. In conjunction with the local farmers, the facility was not only established to milk the farmers’ buffalo, but also purchase a core number of buffaloes to maintain an ongoing breeding programme. A special tour grants a small group of visitor’s exclusive access to the dairy facility, which is not open to the general public. Amongst many activities, we participate in a mozzarella-making class with an Australian Chef and join-in the process of washing and feeding the buffaloes. The more adventurous get the opportunity to hand-milk a buffalo. There is also a talk given about the dairy farm and how they work together with the local buffalo farmers. Luang Prabang Public Library is part of the National Library system of Laos, supported by both the Lao Government and foreign charities and operates the ‘Tuk-Tuk Library.’ We get a unique opportunity to join this Tuk-Tuk Library for the day on a visit to a village school. The goal of this enterprising mobile library is to supply schools and their students in poor rural communities with much needed books, learning activities and games. During the visit, we see the Tuk-Tuk librarians and volunteers hand-over a full book-bag of 100 books to the students, loaned for a period of two to six weeks. This means the schools get a continual supply of new books to read. The Tuk-Tuk team also spend the day with the students conducting fun reading games and teaching them how to respect books, teamwork and more. Southeast Asia’s smallest capital city and Laos’ largest city, Vientiane is nestled along a bend of the Mekong River. This former French Indochina trading post exudes a laidback ambiance and old world charm with a mix of Chinese shop houses, French colonial-era architecture and ancient Buddhist pagodas and temples. Tree-lined boulevards, low traffic density and a historic old quarter, makes Vientiane an ideal place for exploring on foot. Highlights include a visit to Wat Ho Phakeo, a former royal temple and Wat Si Saket, one of the capital’s oldest temples, home to hundreds of small Buddha images. 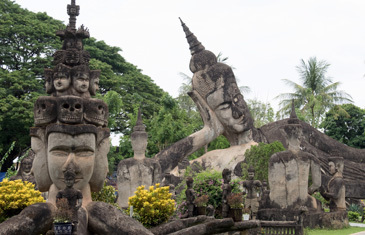 We drive southeast of Vientiane to Buddha Park. Built in 1958, the park is a fanciful sculpture garden dotted with Buddhist and religious images. A highlight is a quirky giant concrete pumpkin with a three-level interior representing Hell, Earth and Heaven. There is plenty of time to stroll around the park to view many of these surreal and ornate statues. 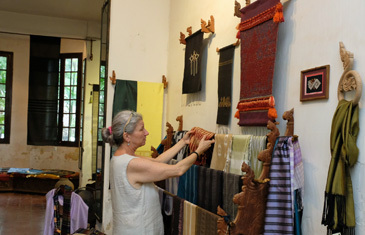 Back in Vientiane, we stop-off at the weaving home-studio of an American textiles expert. Following a visit to Vientiane as part of a U.N. project to promote traditional Laos weaving, she established Lao Textiles Studio. Now employing over 40 local weavers, the studio creates naturally dyed and woven silk pieces reflecting traditional and diverse Lao designs. A guided tour allows us to observe the entire traditional weaving process. On Vientiane’s outskirts, we spend the day at an organic rice, fish and vegetable farm, run by a Lao Non-Government Organization. Maintaining traditional Lao farming methods, this idyllic farm is the perfect place to try your hand at rice farming. Friendly local farmers teach us how to plant rice seedlings while standing in the rice paddies. If this visit coincides with the harvesting season, there’s an opportunity to cut and thresh our own rice supply for lunch! We also participate in other farming activities such as fishing, and harvesting fresh duck eggs, seasonal organic vegetables and bamboo. Learn how to make sticky rice and papaya salad for a picnic-style lunch, prepared the traditional Lao way. Transfer to Vientiane airport for your onward flight.